Being an expat is a peculiar arrangement. You live in country X, but you are forever bound to country O—”O” as in “origin.” Technology has made this a much easier affair. All the lovely webby ways that we are connected make the distances seem cozier indeed. Not to mention the Christmasy feeling of having packages arrive from abroad chock full of goodies, tastes of home…things that you miss. Last week after ridiculous amounts of red tape with the Italian dogana (customs), I was finally able to receive a long awaited box with my name on it…arriving from New Mexico! It was full of chile powders, dried chiles and the makings of posole—all products made by a new client of mine, Los Chileros de Nuevo Mexico. What’s even quirkier about peppers flying from Hatch, New Mexico to Milan, Italy is that they were sent by an expatrioted Briton who calls my native land his home. If that’s not a small, spicy world/soup, I don’t know what is. They’ve even been kind enough to ask me to blog about gastronomic Milan on the travel section of their own new blog, The Chile Trail. Check it out…just another mad mix of ingredients in our global stock pot, where everyone spices up everyone else’s existence. I wouldn’t want it any other way. 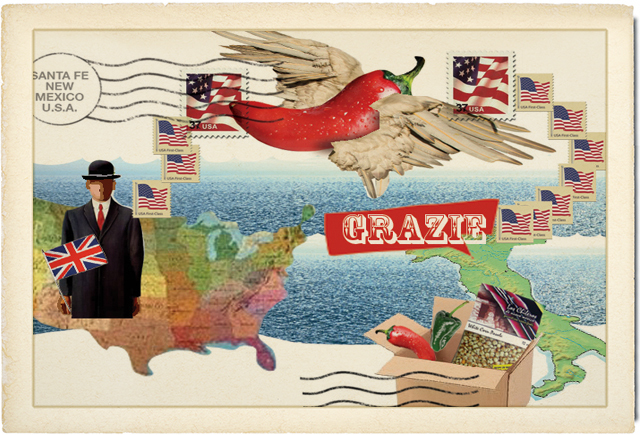 This entry was posted in POSTCARDS and tagged chiles, ex-patriotism, Hatch, New Mexico, postal service, spice. Bookmark the permalink.